In the aftermath of the harrowing, racially motivated killing of nine black parishoners in Charleston, South Carolina, earlier this month, various companies, enterprises, and politicos alike are all having to answer some questions: where do you stand on the Confederate battle flag? Should it fly above your state's capitol grounds? If you sell it, will you keep doing so? And what if fans bring them to sporting events? 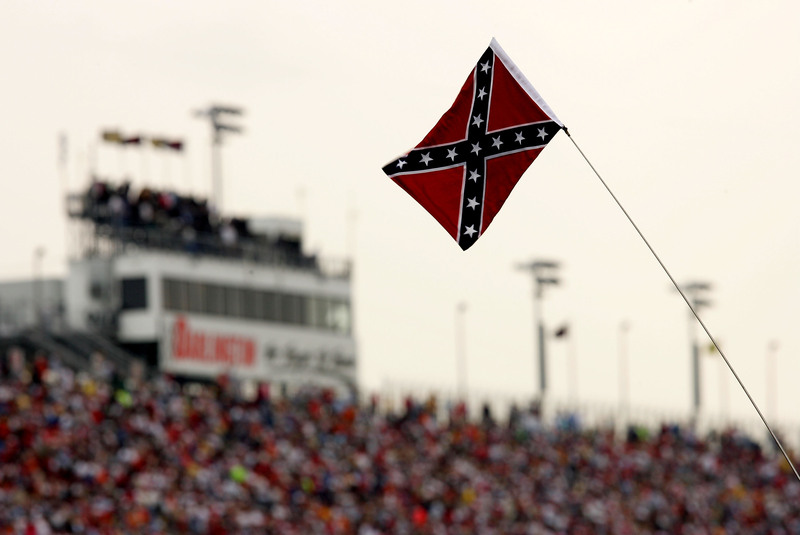 Well, on that last point, get this: NASCAR wants the Confederate flag gone from its events. Specifically, NASCAR chairman Brian France voiced his opposition in no uncertain terms on Saturday, as detailed by the AP. He referred to it as an "insensitive" and "offensive" emblem, and expressed his desire to keep NASCAR events free from it in the future. If all this sounds fairly boilerplate to you, you'd be right — nobody is particularly rushing in to defend the Confederate flag right now, thanks to firestorm of negative publicity it's generating for people and institutions right now. But it's noteworthy just where this opposition is coming from — while NASCAR is a popular sport with fans all over the country, it's heavily patronized by fans across the American south, which is essentially the flag's remaining bastion. We want to go as far as we can to eliminate the presence of that flag. I personally find it an offensive symbol, so there is no daylight how we feel about it and our sensitivity to others who feel the same way. We're working with the industry to see how far we can go to get that flag to be disassociated entirely from our events. It's a forward-thinking move on NASCAR's part, considering how the winds of public opinion seem to be blowing on this, and it certainly doesn't hurt that it's the right thing to do. We're still light on specifics at this point, and that's something to keep an eye on. While NASCAR has made it entirely clear that they won't use the flag for anything — back in 2012, they refused to allow pro golfer Bubba Watson to drive the "General Lee" from The Dukes Of Hazzard TV show, thanks entirely to the Confederate flag splashed across its roof — the use of flags by fans is another matter. Preventing Confederacy-loving fans from bringing in their own flags likely presents some logistical challenges, but what's going on in the crowd is undeniably part of the experience, if not the most intimate, personal part. If you'd feel alienated by seeing a Confederate flag on top of a car, odds are you'd feel the same sitting next to somebody with one, too. In any case, it's refreshing to hear that NASCAR is jumping out in front on this, and hopefully they'll have some success in doing just what French said he wanted: to make sure they're dissociated from such offensive imagery.